It's a funny thing how industries that are in trouble invariably take out full-page ads in the newspapers to proclaim their virtue in search of public approval. Such is the case with Saturday's ad by the Manitoba Pork Council featuring chairman George Mathison. Chairman Mathison, referring to the "red tape reductions" proposed by the province, emphatically proclaims that "None of the proposed changes will lower environmental standards." Come now, George - that really is a bit of a stretch. Just for clarity, let's reference some of the proposed changes that will, no question, result in lower environmental standards. • More pigs = more manure = more phosphorus in the lakes. It's that simple. • Lower building code standards for new hog barns. Proposed changes here involve eliminating the requirement for a dedicated firefighting pond on site, fewer firewall separations within the barn, and less fire retardant coverings. End result: no prospect of fighting a fire once well involved. How is this an environmental issue you say? Well, the 4,000 odd pigs incinerated in last Thursday's New Bothwell barn fire will have to be disposed of somehow. No small environmental mess. Fires like this should not be happening in 2017. Remote monitoring and smartphones mean you know when a fire starts, not when it is too late. Adequate building construction code would give at least a fighting chance of saving most of the pigs. The sooner the insurance industry wakes up to this reality, the better. Especially for the pigs. • Amending the Environment Act to permit new or expanded barns in all parts of the province. This even in areas where we already have a very high concentration of barns, and consequently very high soil phosphorus levels throughout. • Rewriting the definition of surface watercourse to allow hog manure lagoon construction in proximity to or directly on top of surface watercourses that flow seasonally or once in a while. A manure lagoon has no place near any surface watercourse that could potentially carry spilled manure off the property. That is spelled out very clearly in the existing definition and regulation. The proposed change is simply a bad idea, and is a very blatant lowering of the environmental standard. The technical folks in Manitoba Sustainable Development know this, but the bureaucrats and their political masters carry a big stick. It's called a paycheque. Presumably that is why this substantive change was not spelled out in the public consultation document. • Removal of the requirement for on-site professional supervision during lagoon construction, in favour of "post-construction testing." An earthen manure storage most often relies on a clay liner. The placement and packing of that clay needs to be done carefully to ensure the integrity of the structure. Inadequate supervision equals greater risk of lagoon failure equals lower environmental standard. • Increased size of manure lagoons, by up to 50 per cent. More manure in the lagoon = greater environmental hazard when it seeps or leaks. • Removal of the requirement to report on livestock drinking water analysis. So when the well becomes contaminated, no one will know. Hard to see that as anything but lowering the environmental standard. • Implementing odour mitigation measures for new barns, including barn scrubbers and bio-filters. Didn't notice this item in the proposed industry changes? That's not entirely surprising because it's not there. Nothing. Not a mention. So the environmental standard with respect to air quality will continue as it has been up to now - completely ignored. More barns will simply mean larger portions of our rural municipalities will be uninhabitable. Finally the statistics presented in Saturday's ad deserve special mention. I suspect there were very few readers who were conned into believing the hog industry contributes that insignificant one per cent of the phosphorus in Lake Winnipeg. Remember that's why we had an industry wide moratorium - to fight the good fight against the one per cent problem! As if. Whether in fact it was Mark Twain or Benjamin Disraeli who first coined the phrase "Lies, Damn Lies and Statistics." Either way, it's fitting in this case. As with full-page ads, those with a weak case invariably stoop to statistics (real or fake, invariably fake) to bolster their argument. Those so-called statistics are simply not credible, and I'm guessing even chairman Mathison knows that too. In the Western Producer 15 June, I note that even U of Manitoba, Prof. Don Flaten seems to agree, that some manure,... 1 to 2 % from the hog industry is contributing to the pollution situation of Lake Wpg. No credits however were recognized, to Professors David Schindler, Eva Pip, Peter Leavitt, David Lobb, John Vallentyne and several others who have previously determined, in their studies, that phosphorus, and a majority from hog manure is responsible for the pollution of Lake Wpg. I find that unacceptable. The 2005 Interim Report of the Lake Winnipeg Stewardship Board was co-authored by Dr. Flaten. 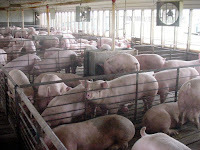 hog industry by compensating for the lack of manure spread acres with a 'license to pollute', since most crops use only 20 lbs. of phosphate a year. Flaten was a main player in developing and recommending this regulation to the government. He knew then that industry was unwilling to incur the expense of treating manure or transporting it from areas overloaded with phosphorous to areas where is not. They still don't. 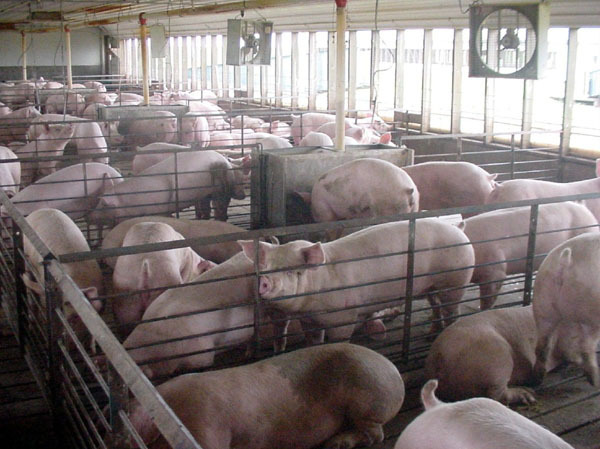 The hog industry does want to build new barns as cheaply as possible by shifting its waste disposal problem to other areas of the province where the same regulation limits apply. Flaten is posturing and once again cheerleading for the hog industry by proposing that polluting industries that want to operate as cheaply as possible can become environmentally sustainable simply by changing location. "It's important to note that the nutrient crisis threatening Lake Winnipeg has been accompanied by a rise in phosphorus of just 10% over the past thirty years, according to Manitoba Water Stewardship. As with global warming, a little bit, it seems, goes a long way. It's also important to note that the Lake Winnipeg Stewardship Board's latest phosphorus estimate (2006) credits all of Manitoba's towns, cities and industrial activities combined – everything we Manitobans do besides agriculture – for just 9% of the phosphorus entering Lake Winnipeg. Agriculture (fertilizer) contributes 15%. (Most phosphorus enters Lake Winnipeg from neighbouring provinces and states and from natural processes beyond our control.) The MPC arrives at its one percent illusion by multiplying an outdated estimate (14%) by 15% (manure applied in Manitoba) and finally 55% (hog manure). But, as we've seen, the synthetic fertilizer applied in Manitoba (85%) counts for little or nothing. The smaller percentage of fertilizer coming from the intensive hog industry is, as most Manitobans have long believed, the dominant phosphorus load on Lake Winnipeg. How dominant? If we deem synthetic fertilizer's contribution to be minimal, say 2%, we get a figure of 12% for all manure. Using Dr.Flaten's percentage for hog manure (55%), we then get 6.6% for the hog industry. This is more phosphorus than the City of Winnipeg contributes to Lake Winnipeg (6%)". unquote.